Atlas of Living Australia. (0). Atlas of LIving Australia. Global compendium of weeds (Randall 2012): environmental weed Environmental Weed List Victoria. Supplied by Weedmanager.Net (Source not cited but possibly drawn from Carr et al. Environmental Weeds of Victoria) (environmental weed) Groves, R.H. & Hosking, J.R. (1997) Recent Incursions of Weeds to Australia. Technical Series N° 3. CRC for Weed Management Systems, Australia. (weed) John Hosking, NSW Department of Agriculture, Weed Database 30 April 2003 (environmental weed, naturalised) Richardson, F.J., Richardson, R.G. and Shepherd, R.C.H. (2006). Weeds of the South-East. An identification guide for Australia. R.G. & F.J. Richardson. Meredith, Victoria. ISBN 0958743932, 438 pages. (weed) The Exotic Flora of Victoria. (1998) Data supplied by Department of Natural Resources and Environment, Victoria, State Herbarium. (naturalised) Flora of Victoria https://vicflora.rbg.vic.gov.au/flora/taxon/78b6e8ae-6809-4cb8-8e57-eadb20733e9e Apparently confined to the Hamilton district where a weed of roadsides, rail-lines and bushland (e.g. at Mt Napier). Environmental weed in southeastern Australia, which overlaps with the climate of California in parts (Cal-IPC). Several species of Hypericum are invasive plants in California and elsewhere. H. canariense and H. perforatum are both rated Moderate on the Cal-IPC Inventory because they have formed dense infestations and displaced native species. H. perforatum covered 2 million acres in California before it was reduced by a biocontrol insect. Native to Madeira and the Canary Islands. Possible naturalization in Spain and southeastern Australia. All of these areas are similar to California. Based on personal observations from Eric Wrubel. Formed dense stands at two locations in Marin County. It is unclear if these populations were introduced by planting or dumped garden waste, but they spread vegetatively into natural coastal scrub and riparian vegetation, displacing native plants. No information so this answer defaults to no. In the Canary Islands, this and other Hypericum species are traditionally used as diuretic, wound healing, vermifuge, sedative and antidepressive agents. Zorzetto, C., Sánchez-Mateo C. C., Rabanal R. M., Lupidi G., Petrelli D., Vitali L. A., et al. (2015). 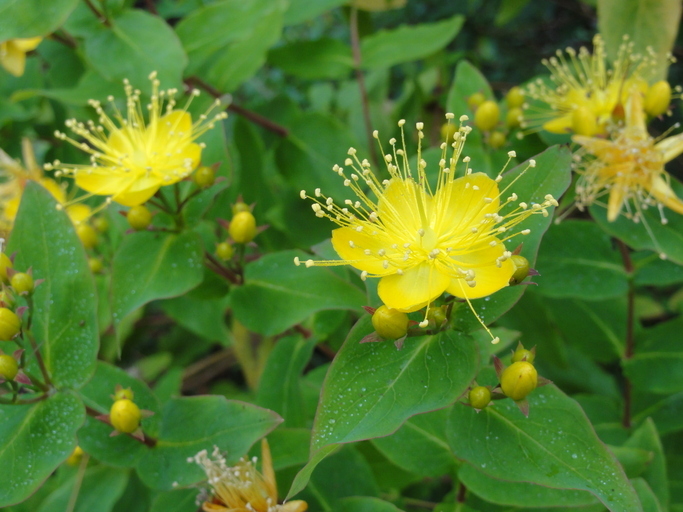 Phytochemical analysis and in vitro biological activity of three Hypericum species from the Canary Islands (Hypericum reflexum, Hypericum canariense and Hypericum grandifolium). Fitoterapia. 100, 95–109. H. grandifolium is an evergreen shrub up to 1.8 m in height (GBIF) but lacks spines or thorns and is not known to form impenetrable thickets. Based on personal observation from Eric Wrubel: This is a rhizomatous species. Forms thickets, which appear to arise from rootstock. In 2011 BAEDN contractors removed a large patch of numerous H. grandifolium shrubs growing in coastal scrub below Hwy 1 at Green Gulch. In 2014 mature plants had grown back from remaining root fragments, indicating that the species is rhizomatous. Other Hypericum species reproduce from seed so H. grandifolium likely does too. No information is available on the number of seeds produced by each H. grandifolium plant. No information is available on the percentage of seed germination or dormancy of H. grandifolium. Flowers from April to July in Spain. There is no documentation of H. grandifolium dispersal by birds or mammals. There is no documentation of H. grandifolium dispersal by contaminated seed, equipment, vehicles or clothing. Insufficient information to complete an evaluation. I do not want to extrapolate information from other Hypericum species without evidence. A journal literature search found no relevant information. Not much online. Although this is suspected to have spread from horticultural plantings in Marin County, the species is not listed in the Sunset Western Garden Book, Dave's Garden website, or Royal Horticultural Society website. The identification of the Marin plants was confirmed by the CA Dept of Food and Agriculture herbarium. Note from reviewer Chris McDonald, UC Cooperative Extension (UC Riverside): I agree there isn't much info on this species to finish the evaluation. However, based on the few sites in Marin Co. it appears to be spreading to new sites, unless it was purposfully seeded or transported. Reviewed by Chris McDonald and Eric Wrubel.